Environment ministry’s contention was that Mahan coal block is under the last remaining patch of very dense, unfragmented forest in Singrauli coalfield region, which spreads across Singrauli and Sidhi districts in Madhya Pradesh and Sonebhadra district of Uttar Pradesh. Some 15 mining projects by industry giants, including Reliance, Hindalco and Jaypee Group, are already operating in the region. 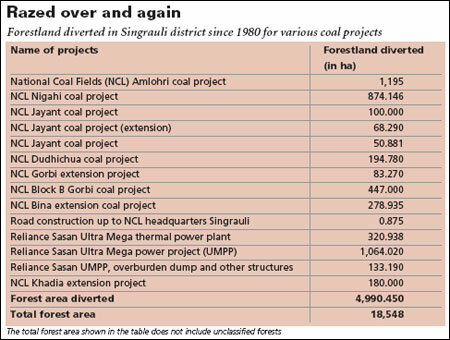 Almost one-third of the forestland in the district has been diverted for mining. 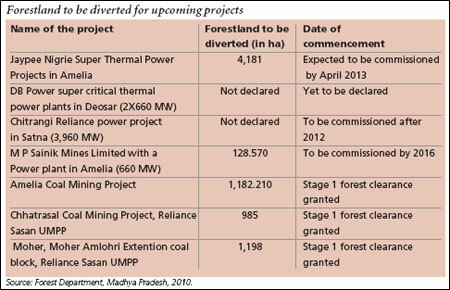 Analysts fear the GoM might grant forest clearance to Mahan Coal. It recently endorsed the report by the B K Chaturvedi committee which says the concept of “go” and “no-go” areas has no legal basis and should not be applied while giving forest clearance to coal mining projects. The high-level committee was formed by the GoM in June this year to examine coal blocks in no-go areas and suggest clearance measures. It found that the go/no-go exercise was conducted only on 37.5 per cent of the country’s coal-bearing areas. Even then there has been a progressive attempt to convert no-go areas into go areas. Initially, of the total blocks surveyed, 396 were designated as go areas and the rest 206 as no-go. But within a year, following interventions of the Prime Minister’s Office (PMO) and change of mind of the environment ministry, more than 70 no-go coal blocks were appended to the go category. As of July 2011, the Chaturvedi report says, there were 470 coal blocks in the go areas (see ‘Auto yes to coal’, Down To Earth, September 1-30, 2011). On July 8, just before passing the matter to the GoM, Jairam Ramesh said he was “unable to agree” to consider forest clearance for Mahan coal block. He submitted the proposal to the GoM with a recommendation that an alternative source of coal be provided for the power plants of Essar Power and Hindalco Industries. MoEF had earlier suggested Sohagpur coal block in neighbouring Shahdol district, where 70 per cent of the reserve is in the go area, as an alternative source. The environment ministry’s inability to take a final decision has been cited as the reason for the matter being transferred to the GoM, but correspondence between Ramesh, the industries and PMO, in possession with Down To Earth, shows otherwise. There was intense pressure on the ministry not only from the industries, but also from the state government, the Union coal ministry and the PMO. Chairperson of the Essar Group, Shashi Ruia, wrote to Prime Minister Manmohan Singh in March 2010 that “65 per cent” of the work on the power plants had been completed and that forest clearance should be expedited. If the project is delayed this will result “in an avoidable huge loss to us as well as the country”, Ruia wrote. Ramesh received a letter from the prime minister on the very day Ruia wrote. In his reply, Ramesh pointed out that Ruia’s argument for granting forest clearance on the basis of 65 per cent completion of the project was flawed. Work should not have started before forest clearances were granted, Ramesh said, complaining that fait accompli has become far too common. “I am not entirely clear why such a good quality forest area should be broken up for such a partial requirement,” said Ramesh in the letter. By the industries’ own admission, Mahan coal block would meet requirements of the power plants for around 15 years, as against their balance life which could extend for another 10-15 years. When letters failed to yield result, both Ruia and Kumar Mangalam Birla, chairperson of the Aditya Birla Group, met Ramesh in May—in a span of a fortnight. It was after these meetings that a special plan began to take shape for bailing out Mahan Coal. Keeping Essar Power and Hindalco Industries in mind, Ramesh suggested a compromise deal to the prime minister. As per this diluted principle, coal blocks falling in “no-go” areas can be given clearance if their ancillary power projects have been completed 60-70 per cent. In August that year PMO called an inter-ministerial exercise for fresh perspective on go and no-go areas. During this exercise, the Union coal ministry introduced a separate Cabinet note to do away with the categorisation of coal blocks as go and no-go areas and clear all pending projects. The correspondence also suggests that the companies had approached the finance minister in January this year asking for a quick decision on the Mahan coal block. The letter by Birla reads: “It is understood that PMO had issued an advice to MoEF to clear the proposals including Mahan where substantial investments have been made.” And this was much before the GoM on mines under the finance minister was even established. The companies did not respond despite repeated attempts to seek their comments. During his correspondence with the prime minister, Ramesh had reiterated that forest clearance to the Mahan coal block “will open a Pandora’s box which we should avoid at all costs”. His concern pertained to the fact that mining in Mahan would not only wipe out the biodiversity-rich forest, worsen pollution level in the critically polluted Singrauli coal field region and threaten the Rihand reservoir, it would also open the door to demands for clearing other coal blocks in no-go areas and explore ecologically sensitive areas for more coal reserves. 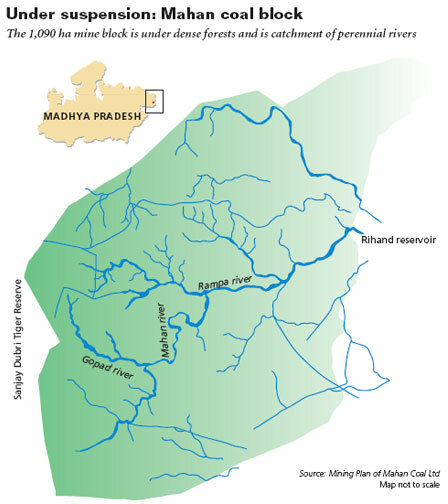 For instance, explains a member of the Forest Advisory Committee (FAC) of MoEF, if mining is allowed in Mahan it would open up 20,000 ha of forest along the Sanjay Dubri Tiger Reserve, which is just 10 km from the coal block. These deep dense forests act as wildlife corridors and buffer zone of the sanctuary. For Essar Power, the FAC member says, clearance to Mahan would mean potential clearance to two more coal blocks in Jharkhand that are also in no-go areas. With an estimated 170 million tonnes of reserve, Chakla and Ashok Karkata coal blocks in Jharkhand will fuel Essar’s upcoming 2,000 MW Tori super-thermal power projects in the state. Essar has already started pressuring the Centre to clear these blocks, saying that “the projects are in the advance stage of execution”. Ironically, Mahan was the only coal block that was stalled. Following an inter-ministerial exercise at the behest of the PMO in August last year the environment ministry had granted stage I forest clearance to six coal blocks in the vicinity of Mahan. All of them fall in no-go areas. The list includes Chhatrasal, Moher Amlohri and Moher coal blocks of Reliance Sasan Ultra Mega Power Project; Amelia North and Amelia coal blocks of Jaypee Nigrie thermal power project; and Dongri Tal 2 of the Madhya Pradesh State Mining Corporation. Unlike Mahan, these mines are in fragmented forest areas, says the FAC member. However, they are yet to get final forest clearance and will have to comply with strict terms of reference (TOR). If the GoM accords forest clearance to Mahan, it would lead to the dilution of TOR, he cautions. Unlike the other coal blocks in Singrauli and its adjacent coalfields, Mahan is nestled in the undulating hills covered with thick tropical deciduous forests. Placed about 600 metres above the sea level, more than 90 per cent of the 1,090 ha coal block allocated for mining is under the Mahan forest reserve. It also falls in the catchment area of two perennial rivers, the Rampa and the Mahan, and the Rihand reservoir. Hundreds of streams and rivulets originating from the hills feed these water bodies. According to the report of FAC sub-committee, which visited Mahan early this year to consider forest clearance, the reservoir, located on the border of Singrauli and Sonebhadra district of Uttar Pradesh, is the lifeline for farmers as well as industries in the region. Mining the coal block could dry up the rivers as well as the reservoir, it cautions. Mahan has a very high stripping ratio of 6:1. This means to excavate every tonne of coal six tonnes of soil and waste has to be removed in this hilly region compared to other areas. Such high-scale overburden on the slopes will lead to massive siltation in the water bodies, choking their flow and imperilling water supplies. Non-perennial streams exist in the Mahan coal block. The FAC sub-committee also found that the quality of the forest and tree cover is much better than what is being claimed by the companies (see ‘Lies nailed’ on p11). The committee’s estimate shows the coal block is in the middle of a 2 km-wide corridor, which has fairly thick forest comprising sal, tendu and mahua trees. The area proposed for diversion has more than 500,000 mature trees. A wildlife census in 2006 found more than 600 wild animals, including leopards, wild boars, sloth bears, barking deer, chinkara, nilgai, python and various primates in the Mahan forest reserve, adjacent to Sanjay Dubri Tiger Reserve. “We often spot elephants and tigers in this corridor. It is contiguous with the Bandhavgarh National Park in neighbouring Umaria district,” says Anil Singh Bagher, sarpanch of Jamgadhi village. 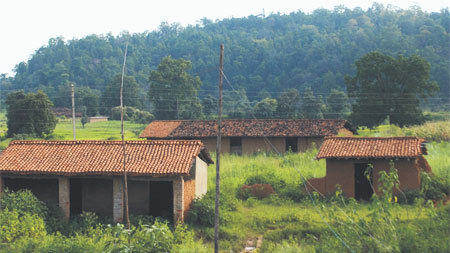 Jamgadhi, Budher and Amelia are the three villages that have traditionally lived in the Mahan forest reserve but will face eviction once Mahan Coal is granted forest clearance. The wildlife corridor is “compromising” the development of about 10,000 ha to 11,000 ha in Singrauli, the then Principal Chief Conservator of Forests told the FAC sub-committee during its visit to Mahan in June this year. To reduce the impact of forest diversion, he had proposed acquiring around 8,000 ha of non-forest land near Sanjay Dubri Tiger Reserve, displace people from the area, afforest it and then translocate the wild animals that frequently visit the corridor. FAC sub-committee rejected the plan, raising concerns about its ecological impact. 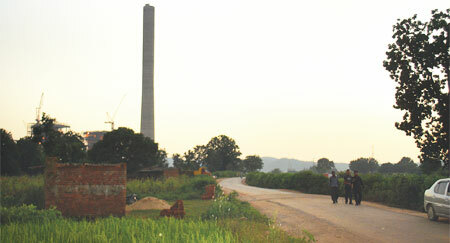 Documents available with Down To Earth show Mahan Coal in 2009 pledged to bear Rs 11.30 crore for the conservation plan. The district administration also reasons that allowing mining and thermal companies to establish their projects and then shoulder the corporate social responsibility is the only way to develop this tribal-dominated backward area. “These people need schools and healthcare more than anything else. Big projects will bring development in the area,” says Vivek Gupta, sub-divisional magistrate of Singrauli. The industries have already assured compensation, temple, hospital and schools to the communities. While some are building huts and small houses across the proposed mine area in the hope of receiving more compensation, many are refusing to give away their land for mining. “Our life is intertwined with the forest. We depend on it right from firewood to food and living,” says Chandra Bali, a Gond tribal in Jamgadhi village. The compensation and a house would not be sufficient, adds Bali who would lose four hectare to Mahan Coal once it gets the go-ahead. Bali’s community could have refused to part with the land using the Forest Rights Act of 2006. District Collector P Narhari says since they are not aware of their traditional community forest rights, they did not file any application regarding the claim. The 35 km road that connects Mahan with the district headquarters shows the “willingness” of the companies to develop the area. Continuous movement of trucks and earth movers ferrying equipment to the plants under construction have caused potholes, making the road non-motorable. Recently, Singrauli district collector slapped Essar with notices for failing to carry out necessary repairs of the road. In January this year, the environment ministry counted Singrauli coalfield region as the seventh most critically polluted area in the country. This was done on the basis of a survey done by the Central Pollution Control Board and the Indian Institute of Technology- Delhi. The region had scored 81.73 on the Comprehensive Environmental Pollution Index. Consequently, a temporary moratorium was imposed on further expansion on mining and related operations in the area. The Madhya Pradesh State Pollution Control Board (MPSPCB) was also ordered to ask industries operating in Singrauli to submit draft action plans for cutting down pollution in the area. However, the moratorium was lifted within six months. Officials in the environment ministry say the remediation plan submitted by MPSPCB was satisfactory and hence the moratorium was lifted. Incidentally, all these years MPSPCB had no branch in this mining hub. It was only in September this year that a regional office has been set up in Singrauli to monitor pollution as per the remediation plan. In the same month, the Madhya Pradesh State Mining Corporation allowed Essar Power to mine coal from Amelia block, even though the environment and forest clearances for the block are pending. stop this nonsense, it is like robbing your own house.... you people have no right to utilize and degrade mother earth.. Thank you for this post Anupam. Would love to read more stories like these. The issue breaks my heart but the more we write and communicate this to the world, the better are our hopes of fighting it.